Is your school ready for one to one computing? Handhelds, laptops, tablet PCs…Which is best for your school? 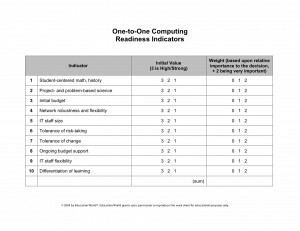 Guest columnist Elizabeth Sky-McIlvain offers a simple rubric for administrators, teachers, and parents to use when evaluating their school’s readiness for one-to-one computing. Print this rubric and share it with your entire school community. Education World ® Technology Center: One-to-One Computing. At present, our school wants to believe that we have a situation of one to one technologies. The teachers all have laptops instead of desktops but yet they are not certain what to do with them. Some of them use their laptops to enter marks and are quite afraid to do anything else. In addition, their machines are locked down an you are unable to do many things – which in my mind defeats the purpose. As for the students, there are complaints that the wireless connection is extremely slow and that they would rather work in the computer lab with the desktops. They prefer the speed. Interesting situation, Jen. I’m a proponent of the instructor liberation movement. Locked down technology is antithetical to innovation or any hope of enlightened instructional practices, in my view. Sounds pretty scary, Jen. This also comes back to the fact that not all teachers are comfortable with technology (or will know how to use it once given to them). Much of what I believe comes from experience at the university Language Centre I work at — the us e of a computer does not go beyond email, Power Points, and word processing. I’m not saying that they are poor teachers (because they’re not), but what I am saying is that they are trained in other teaching and learning practices. Like David, I view locked down technology as being counter-productive. In my school there are two networks, the school wide network and my lab’s tech network that I share with the electronics teacher. The school network and attached machines are locked down so tight that a teacher can’t even install a F/OSS application like firefox (and Safari doesn’t follow the rules of HTML very well, so firefox often works better on all of the online tasks we now have to do). My tech network is relatively unrestricted. Most students know the machine’s admin password so that they can install apps/fonts/brushes/plugins as needed. They will never have the network admin password, but they are free to modify software as long as they have the rights to use the software and that it won’t affect other users. They do have to ask me first, but it’s so that I know what’s being installed. What’s interesting is that the school network is constantly being vandalized or circumvented, which repeatedly results in network outages and banned ip’s and such, whereas the tech network hasn’t gone down in four years with the exception of power failures. The IT staff that services my school don’t like that my network is “unsecured,” but the fact that they haven’t spent an hour on maintenance in my lab in four years speaks for itself. I guess that this was the long way of saying that students seem very capable of acting responsibly on their own. Being supervised, or having the conversation about use, rather than being locked out seems like the way to go. Interesting contrast of styles, expectations and results, Byron. Your expectations are high, and so responsibility seems to follow on the part of students. I think they appreciate your confidence in them and rise to that opportunity in positive ways. With a few more case studies of this sort and good data, a real trend could emerge, as well as a predictable approach to opening up networks. Yes, thanks for sharing Bryan. A very interesting contrast. You also made me realize that I didn’t really consider everything going on here at our university. All classroom computers are locked down and we can use only what has been installed by the IT staff. Fine; I think security is needed at a university where thousands of people come and go freely to and from the rooms. But what is often frustrating is that the installation of applications that our centre develops sometimes get rejected by the IT staff due to security concerns. This often baffles our staff. How can we make us of the applications that we design to assist students with language acquisition if we can’t use them in our classrooms or demonstrate them? One way around this is to remotely connect to our office computers, but this is sometimes slow and frustrating. When I worked with SD 92 (Nisga’a) the district began a 121 initiative with every student in the district having access to a ibook G4 and a somewhat restricted wireless access to the net. It was and I believe still is a strong element of their educational plan. Students above Gr 3 were allowed to take them home with a lot of relative freedom. Both in that district and in Fort St.John students participating in the 1-1 laptop wireless writers program demonstrated great care and pride in their laptops and very few were damaged and less then 10 were stolen or lost (at least in the two years I was involved). Help! My school has nine-year computers with tube monitors running Windows 2000! And, our Internet connectivity is via a satellite dish throwing the signal: Slow, unstable, and unreliable. This school is part of one school district, but equity is not the name of the game at all.